Confessions. Getting right to it. 1. 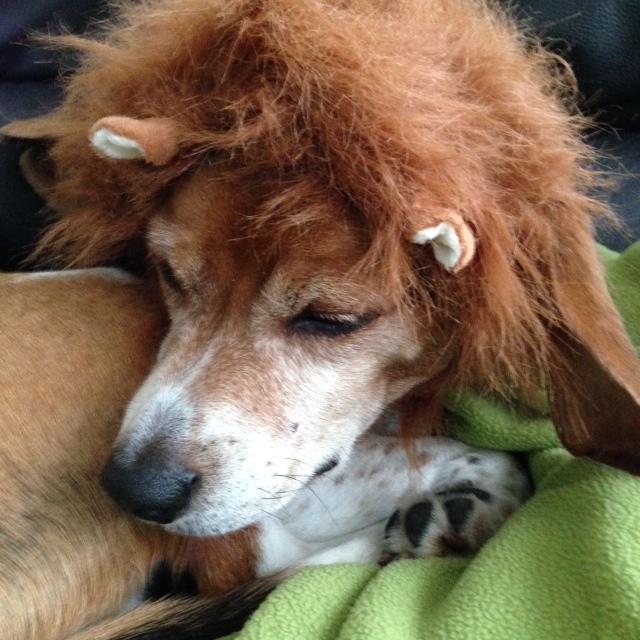 I really want Reggie to wear his Halloween costume every day this month. It looks too funny and I can’t get enough of it. 2. 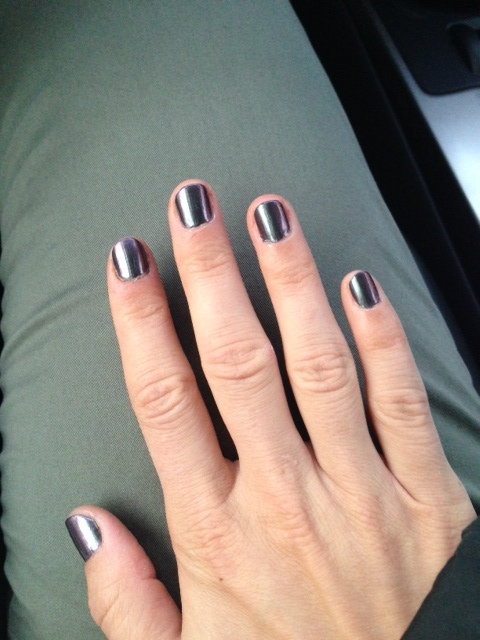 I went to SEVEN drug stores yesterday to hunt down my latest Essie obsession. Not only did I text the work ‘EUREKA!!!! !’ to Tyler, but I also shouted it out loud in the store when I discovered my mission had finally been accomplished. 3. One of my co-worker/new friends invited me to get my hair and makeup done for free. 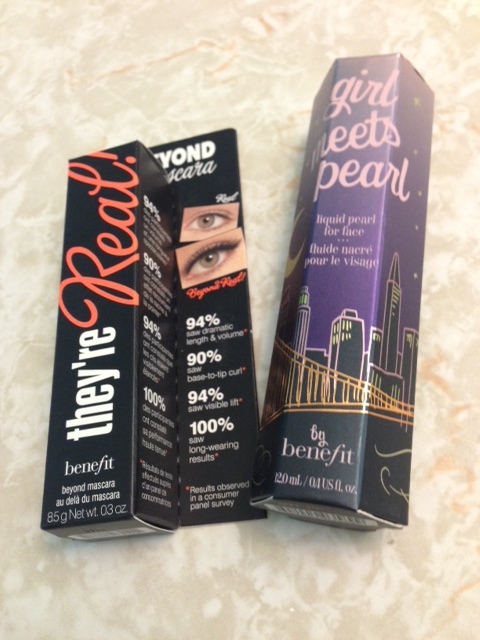 And it just so happened that I was able to get my makeup done by the Benefit counter. Aka: the recipient of most my money for the past 12 years. The girl was trying to sell me some of the products, and every one of my responses were: “I already have that” I managed to pick out two things that I felt I needed the most. Plus I got a free makeup bag and TONS of samples. 4. When we can’t decide what to have for dinner, it’s almost always Turkey Clubs. They’re yummy and easy to make. That is all I have to say about that. 5. I have been OBSESSED with edamame lately. Like, I have been ordering it as an entree in restaurants (me-thinks my over exuberant sucking-of-the-pods is what got us our free meal last week. I mean, think about it. You’re a guy and you’re alone at the bar and you see some lady going to town on hoovering some beans out of their straw-like homes and you might be tempted to just pay for the pleasure. I get it.) This weekend, threw together a batch with a sriracha sauce. And it was so good. And my face was sweaty and on FIIIIIYYYYYAAAA (read: fire) afterwards. 6. My mama sent me some fall goodies! 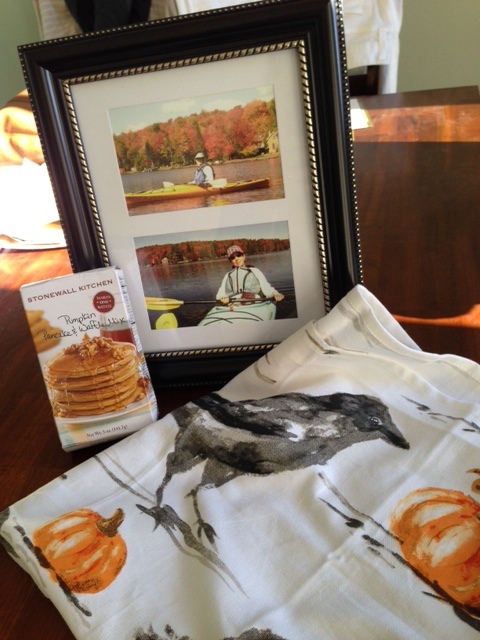 Pumpking pancake mix, a cute kitchen towel, and a frame of her and my dad somewhere in the Adirondacks kayaking. And you follow me on IG, you’ll have read that I am now a cider donut and slice of ma’s apple pie away from feeling as though fall is complete. I’m not one to love the cooler weather (let’s just take a second on laugh at my current geographical location then) but I do love some of that comfort food/outdoorsy mumbo jumbo. To make up for my lack of east coast fall-wonderfullness, I threw together a batch of cranberry muffins. Mmmmmmm SO GOOD. 7. I have been running outside. You’d think I would have taken advantage of this during the warmer months, but I surprisingly love slightly cooler weather for running. Plus, I feel bad for not having taken advantage of outdoor running in the summer months, so I’m trying to squeeze a few in before it gets dark too early. Let’s all let out a collective sigh for when THAT happens. 8. I have been loving this song lately. I had to drive into work today to leave early for a doctor’s appt, and I cranked the crap out of my stereo when it came on. Mind you, this is at 7:30am when just about every person on the road is a Mr. or Mrs. Cranky Pants for having to be awake. And I was head bobbing and steering-wheel-tapping. Aw, your Mom is so sweet. I want one of her cranberry scones. I also feel like I should send your Dad some crossword puzzles… or maybe a nice Sudoku. 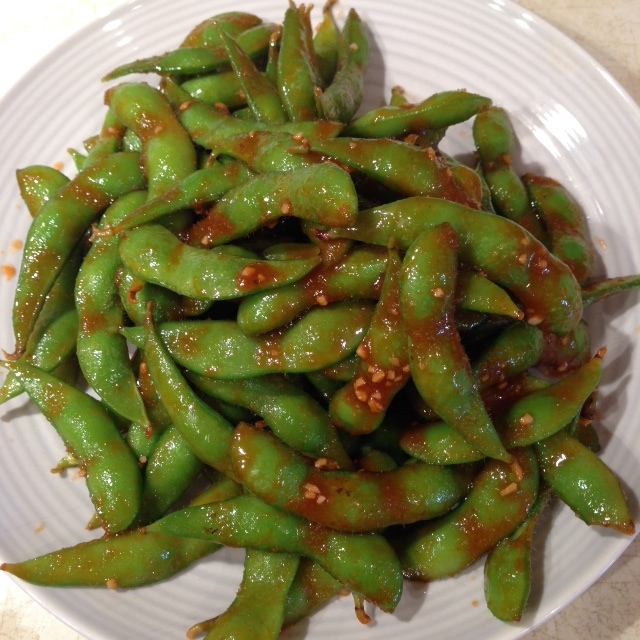 Spicy edamame is so good – I haven’t tried it with sriracha, but I love how they serve it at Roys Hawaiian fusion – tossed with some spicy chili, sesame oil and lots of coarse sea salt. God I love Monsanto. My mom will send or bring me festive holiday/season things, too- they are the best! YES to For the Twill of It!! That’s one of my favorites. You are far ahead of me- I still need to get my kid a Halloween costume. You are dedicated and obviously have far too much time on your hands to go to 7 stores to find a nail colour! Oh a free Benefit makeover would have been so nice! I love their mascara. 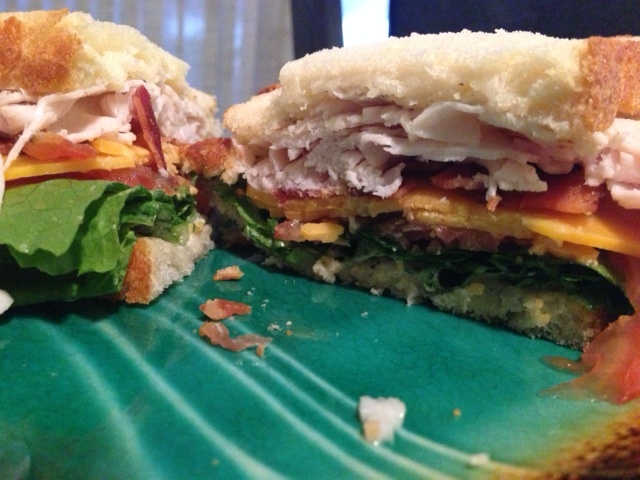 Oooh- turkey clubs as a go-to meal? That sounds awesome. Ours is tacos.. always. Glad I never get sick of them! 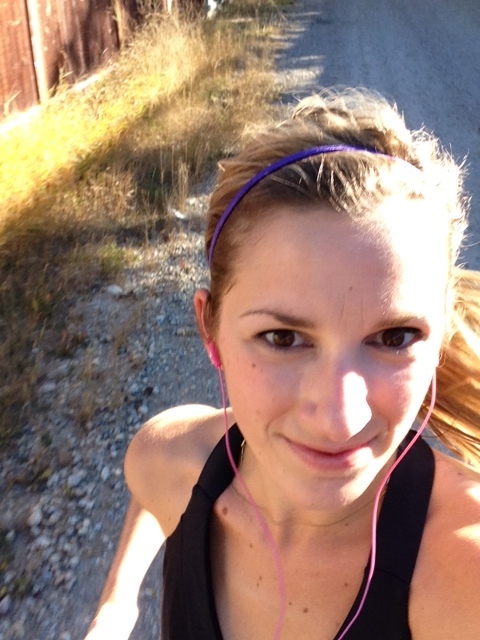 I’ve been running outside lately too. Well, that’s the only running I’ll do. I despise treadmill running!